After-Christmas sales are great for everyone! 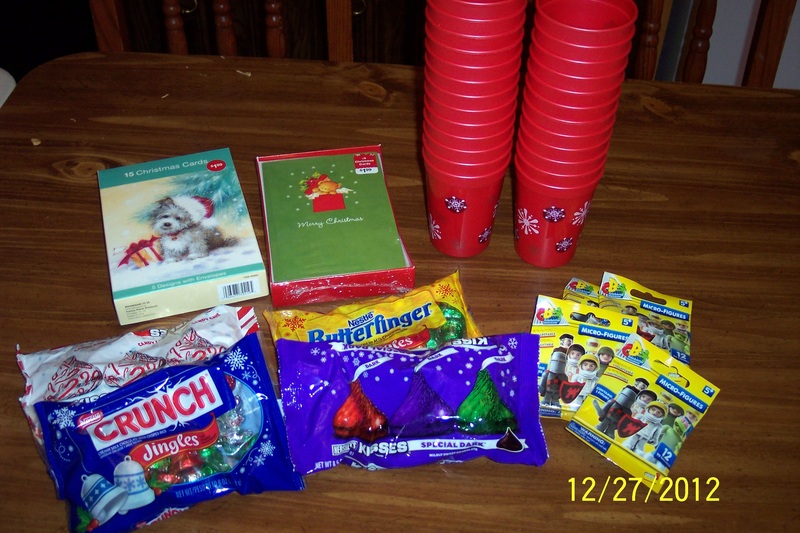 ∞ Holiday candy: Who cares if the candy is wrapped in red and green? Still tastes as good! I got two bags of Hershey’s Kisses (regularly $3.49/bag, on sale 50% off, also had a $1.10 coupon off 2 bags) = $1.19/bag. I also got two bags of Nestle candy (regularly $3.49/bag, on sale 50% off, also had a $1 coupon off 2 bags) = $1.24/bag. ∞ Stocking stuffers: Great place to look for small toy items. You’d be surprised – not everything looks Christmasy or has to do with a holiday character. I found some small figurines by a brand I had never heard of. They may not be Legos, but for $1 each (50% off $2), they are great for our prize box. ∞ Holiday cards: Why buy them for full price? Instead I stock up each year for the next. I normally do a photo card to friends and family, but I never seem to get them out on time. So it is always nice to have some Christmas and Chanukah cards on hand to put with a gift, food item, or send to someone if I need to. I got two boxes of cards (15 ct) for $.99 a box (50% off $1.99). Can’t beat that! ∞ Decorative items: You never know what you might find that can have another use. I found plastic cups with snowflakes on them that were 3 for $1. With the 50% discount they came to $.16/cup. I got 25 for my students for next year (no matter what age I end up teaching) for only $4! I can use them to put their holiday treats in! This price beats the four-pack that I have seen sometimes at the dollar store. Target is my favorite place to shop for after-holiday sales because they always have a pretty good selection after most holidays. 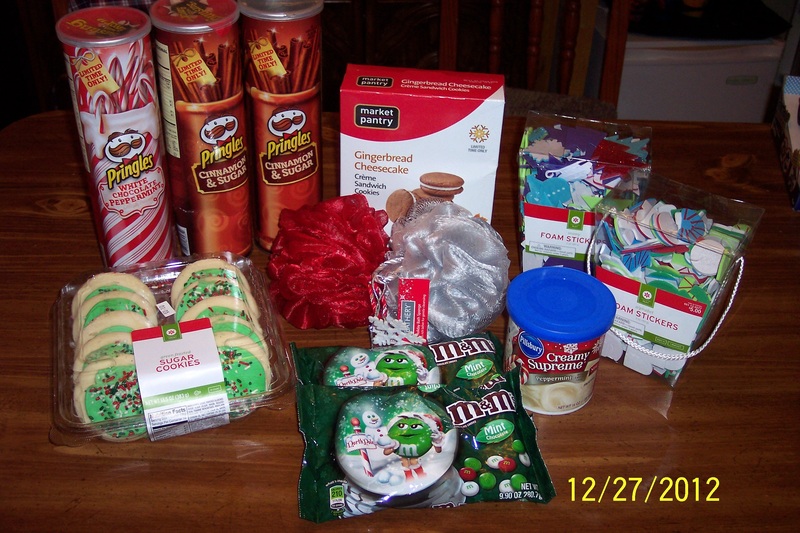 – Holiday cookies: At 50% off $2.99, I got a nice after-dinner treat for $1.49 a package. These cookies were $1 to $2 more at the grocery store, even on sale! – Limited edition ginger cheesecake sandwich cookies: We had tried these a few weeks ago and almost everyone loved them. Now at $1.68 a box, they are an even better deal! – Baking items (peppermint icing): We enjoyed this seasonal flavor on cake this past Shabbos. It was a nice change of pace. I really should have bought two because it seems like the parve icings don’t go on sale as much as the dairy ones! The icing was $.94 a can (50% off $1.89)! – Shower puffs: Again color is not important, but at $.99 each for a shower puff, I get a nicer puff than I could get at the dollar store! I found these last year as well. I found a few more items when shopping at these two stores. 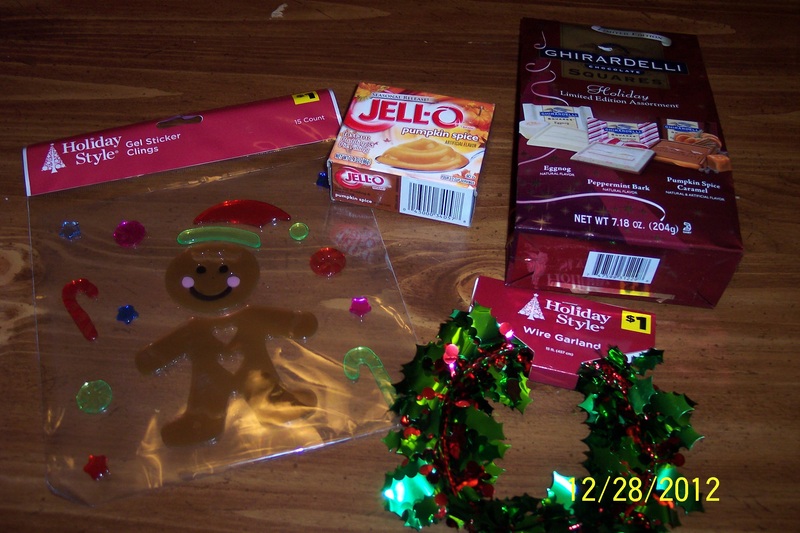 The holiday decorations are to use on my classroom window (50% off $1 = $.50 each) and the jello pudding was a pumpkin spice flavor. Sounded really good, especially for $.80. The Ghirardelli seasonal chocolate was 50% off $5 = $2.49 a package, and also included some interesting seasonal flavors like peppermint and pumpkin spice! I had hoped to find some cake or cupcake mixes (for last-minute baking) or some holiday candy (for goodie bags for my students) this year, but no such luck. Chocolate was in abundance, but I worried about saving chocolate for a year! I hope this post gives you some ideas on how you can save next year at the after-Christmas sales and maybe at some other post-holiday sales!